These 100% new Accel HEI distributors are the perfect choice for your performance street machine. 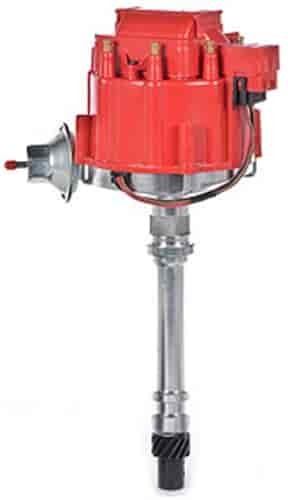 Features include high-performance Accel electronics, centerless ground shaft and high-dielectric strength cap with balanced rotor for higher RPM efficiency than stock units. Does Accel 59107C fit your vehicle? 59107C is rated 5.0 out of 5 by 3. Rated 5 out of 5 by ScottfromMA from Distributor Looks to be high quality. Although It arrived with a cracked cap, Jegs replaced it quickly, and at no charge. It appears to have been damaged at manufacturer as boxes were in damaged. Installed with out a hitch. Rated 5 out of 5 by Satchmo from Looks great! I bought a cheaper distributor for my Jimmy build. It sat for about 2 years and then wouldn't fire up. Pick-up coil tested bad. Rather than fix the cheap. I bought the one I should have in the first place. Will this distributor work with a MSD 6A? This is compatible with a 6A box. Yes, the gear is melonized steel. What is the coil output? ?